The exhibit, Joystream, will be up for the month of December in WICA's Kristin and Earl Lasher Gallery. 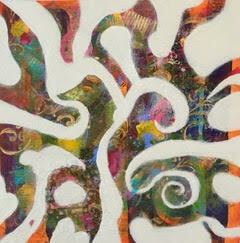 There will be an opening reception during Langley's First Saturday Art Walk, December 1st from 5 - 7PM. Victoria Castles' art celebrates unlimited possibility: no boundaries, no restrictions, no apologies. In our world so torn with cruelty and despair, I wondered how making art could have any value. Bringing lightness, love, and joy into the world is my aim. A number of Castle's paintings are available as prints on paper, metal, and silk in a variety of sizes and prices. Also as greeting cards. "The art in our home is the company we keep. It's personal. It's got an energy or presence or message that speaks to us. Make no mistake, art has a voice of it's own. And the more I've learned to listen, the more I'm led to Happy Accidents. Every painting has a mind of its own and tells me what it's time for next. As an Improv performer, I've learned that creativity flows best when unrestricted - and to listen for cues. I get to be the conduit. Not taking myself too seriously helps too! And being willing to get messy as in not-orderly or well-behaved is a must. Ripening does wonders encourage wildness, and I consider Wildness a missing ingredient for too many of us, " says Castle.